It would've been fun to see Tony Romo actually play a game for the Dallas Mavericks. 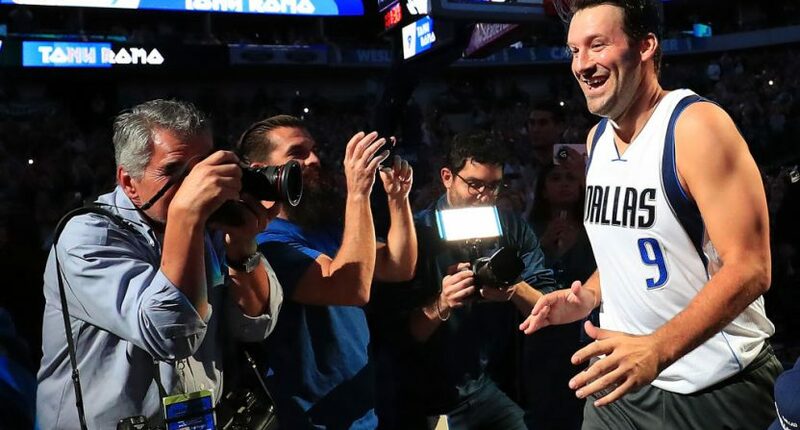 Tony Romo had a good time warming up with the Dallas Mavericks before Tuesday’s game against the Denver Nuggets, but Mavs owner Mark Cuban wanted Romo to play in the actual game. But NBA commissioner Adam Silver nixed the idea. Cuban and the Mavericks wanted to honor Romo for his 14-year tenure as the Cowboys quarterback. Romo missed the first 10 games of the 2016 season due to a fractured vertebra. When rookie Dak Prescott led the Cowboys to a 13-3 record and won AP’s offensive rookie of the year award, it spelled the end of Romo’s time in Dallas. Rather than try his luck with a new franchise, he chose to retire and become an analyst for CBS. Considering former NBA player Caron Butler said Romo’s basketball skills in their high school days could have translated to the NBA, seeing Romo on the court would have been a nice addition to a meaningless game — the Nuggets and the Mavericks are both eliminated from the playoffs. Thank you #mavs. I'm humbled by your gesture…At least I made one shot today. Tony Romo & Devin Harris go 1v1 in pre-game warmups, nothing but net. ? Romo didn’t get to play, but he still got a pregame introduction with the team. Not a bad way to head out of Dallas.